In Yemen, internally displaced children stand outside their family tent after the family fled their home in Saada province and found refuge in Darwin camp, in the northern province of Amran. The number of people displaced from their homes due to conflict and persecution last year exceeded 60 million for the first time in United Nations history, a tally greater than the population of the United Kingdom, or of Canada, Australia and New Zealand combined, says a new report released on World Refugee Day today. The Global Trends 2015 compiled by the Office of the UN High Commissioner for Refugees (UNHCR) notes that 65.3 million people were displaced at the end of 2015, an increase of more than 5 million from 59.5 million a year earlier. The tally comprises 21.3 million refugees, 3.2 million asylum seekers, and 40.8 million people internally displaced within their own countries. Measured against the world’s population of 7.4 billion people, one in every 113 people globally is now either a refugee, an asylum-seeker or internally displaced – putting them at a level of risk for which UNHCR knows no precedent. On average, 24 people were forced to flee each minute in 2015, four times more than a decade earlier, when six people fled every 60 seconds. Syria, Afghanistan and Somalia produce half the world’s refugees, at 4.9 million, 2.7 million and 1.1 million, respectively. Colombia had the largest numbers of internally displaced people (IDPs), at 6.9 million, followed by Syria’s 6.6 million and Iraq’s 4.4 million. While the spotlight last year was on Europe’s challenge to manage more than one million refugees and migrants who arrived via the Mediterranean, the report shows that the vast majority of the world’s refugees were in developing countries in the global south. In all, 86 per cent of the refugees under UNHCR’s mandate in 2015 were in low- and middle-income countries close to situations of conflict. Worldwide, Turkey was the largest host country, with 2.5 million refugees. In terms of the refugee-to-population ratio, Lebanon has the highest proportion, with nearly one refugee for every five citizens. Distressingly, children made up an astonishing 51 per cent of the world’s refugees in 2015, with many separated from their parents or travelling alone, UNHCR said. “Our responses to refugees must be grounded in our shared values of responsibility sharing, non-discrimination, and human rights and in international refugee law, including the principle of non-refoulement,” UN Secretary-General said in his message on the Day. “World Refugee Day is a moment for taking stock of the devastating impact of war and persecution on the lives of those forced to flee, and honouring their courage and resilience,” he said, noting that it is also a moment for paying tribute to the communities and States that receive and host them, often in remote border regions affected by poverty, instability and underdevelopment, and beyond the gaze of international attention. Last year, more than one million refugees and migrants arrived in Europe across the Mediterranean, in unseaworthy dinghies and flimsy boats. “Thousands did not make it – tragic testimony to our collective failure to properly address their plight,” Mr. Ban said. He stressed that meanwhile, divisive political rhetoric on asylum and migration issues, rising xenophobia, and restrictions on access to asylum have become increasingly visible in certain regions, and the spirit of shared responsibility has been replaced by a hate-filled narrative of intolerance. “With anti-refugee rhetoric so loud, it is sometimes difficult to hear the voices of welcome. But these do exist, all around the world,” he said, acknowledging an extraordinary outpouring of compassion and solidarity shown by host communities. The UN chief drew attention to the General Assembly’s High-Level Meeting on addressing large population movements on 19 September, which he said will offer an historic opportunity to agree a global compact, with a commitment towards collective action and greater shared responsibility for refugees at its core. He warned that instead of burden sharing, nations are closing their borders and that instead of political will, there is political paralysis. And humanitarian organizations like his are left to deal with the consequences, while at the same time struggling to save lives on limited budgets. “UNHCR sees 2016 as a watershed moment for the refugee cause,” he stressed. As wars spiral out of control, this must be a year to take collective responsibility and action to end the conflicts which force people to flee and also a year to help the millions of people whose lives have been destroyed by violence. “World leaders can no longer watch passively as so many lives are needlessly lost,” he said, also noting that the upcoming General Assembly meeting on addressing large movements of refugees and migrants will put all to the test. For its part, UNHCR launched last week the #WithRefugees initiative to generate momentum towards that meeting, he added. Mogens Lykketoft, UN General Assembly President, said the numbers do little justice to the pain and trauma that this crisis is causing for individual women, men and children across our world. “They fail to capture the hardship of those who flee and the fear of those who wait anxiously behind. They fail to capture the hopelessness of those held in detention centres or the final thoughts of those lost at sea without even a whisper,” he said. He highlighted several points, including that the international community must intensify its efforts to find political solutions to conflicts, as they are the main drivers of humanitarian need. The UN and other institutions and agencies must be provided with sufficient and predictable resources needed to fulfil their mandates and respond to the incredible levels of need. In 2014, children constituted 51 per cent of the refugee population, with half of these missing out on primary education, he said. The 2030 Agenda for Sustainable Development to leave no one behind has placed a new obligation on all to reach those in situations of conflict, disasters, vulnerability and risk. Citing that almost nine out of every 10 refugees, 86 per cent, are in regions and countries considered economically less developed, he urged the international community to enhance its solidarity with refugee hosting countries. Given the scale of the crisis, current levels of third-country resettlement need to be reviewed, he pointed out. In 2014, only 15 per cent of the global resettlement needs were met. At least fifty thousand persons, including thousands of children died in the past two decades while seeking to cross international borders. Governments must create safe, orderly and regular pathways for refugees to move to other countries. Violations of international humanitarian and human rights law are of grave concern. All must speak out in the face of serious violations of international law. Xenophobic and racist rhetoric seems not only to be on the rise, but also to be becoming more socially and politically acceptable. This needs to change, he said. 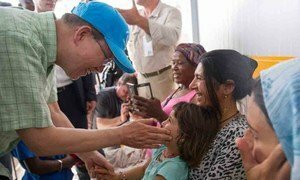 Visiting the Greek island of Lesbos, which has become migrants' entry point to Europe, United Nations Secretary-General Ban Ki-moon today called on the countries in the region to respond with a humane and human rights-based approach, instead of border closures, barriers and bigotry.